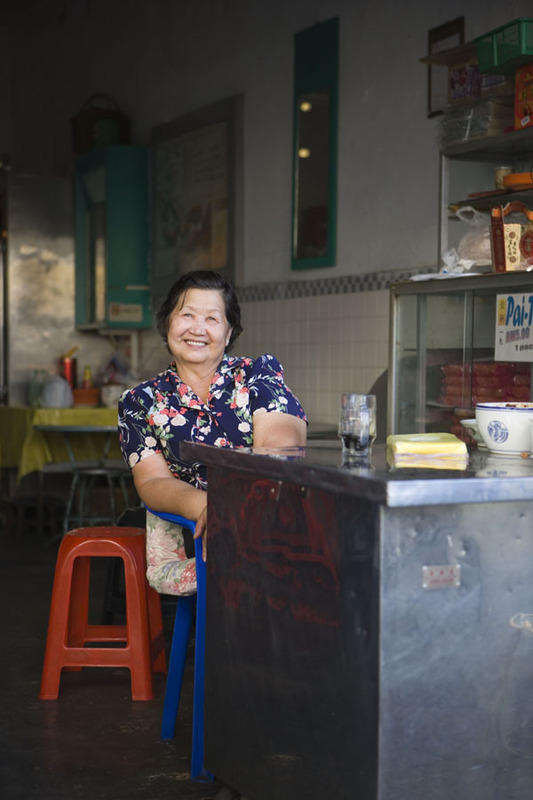 A word of advice: If you're in Penang, and you're watching your weight, do not hook up with this woman. Don't let her petite frame fool you; she'll run you ragged and shoot your diet to hell (albeit deliciously so) all in the short space of one afternoon. We met up with Bee after a full morning of research (read: eating) for an article on a local food tradition. We'd started the day with kerabu beehoon and moved on to all manner of snacks and small bites, starting slowly and picking up speed (and bulk) as noon approached. After a two-hour break we felt almost ourselves again. Then the whirlwind and font of local knowledge that is Bee arrived at our hotel. The next few hours would seriously challenge our commitment to culinary exploration. After stopping at one of Bee's favorite shops for a snack that, at her behest, suddenly turned into a full, dinner-sized meal (and a fine one at that), we moved on in search of mee goreng (fried noodles). Mission accomplished, our bellies begged us to call it a day. Bee would hear none of it. Bee favors three spots for Chinese-style pasembur, a melange of fresh and cooked ingredients doused in a sweetish sauce that is rarely found outside of Penang. The first was closed. Respite! The second, too - shut tight. Our stomachs breathed a sigh of relief. 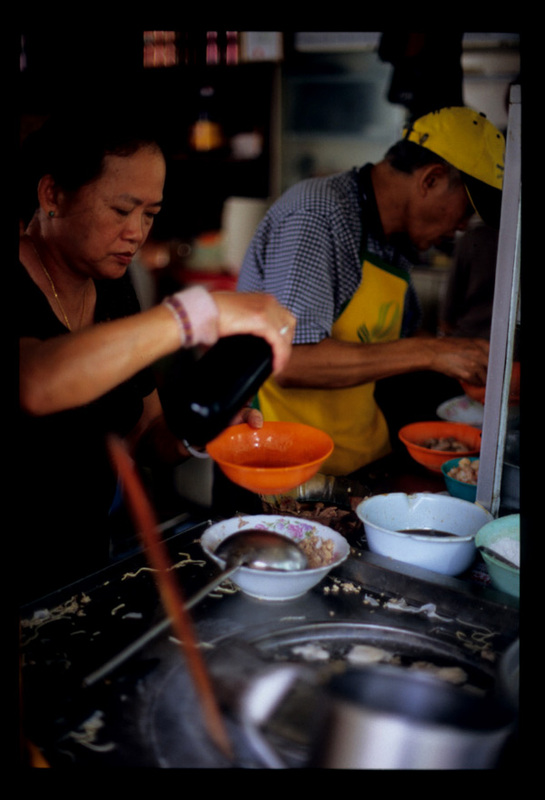 The third, a stall at the hawker center opposite the Batu Lanchang wet market, was open. Groan. Thankfully, the dish is, as Bee described, a relatively light one. The vendor - who was recently visited by a crew from Malaysia's 'Ho Chiak' food show - starts by piling on a plate strips of cucumber and jicama, chopped firm tofu, bean sprouts, crispy shrimp crackers, and squares of chewy fried fritters. On top go a couple of generous spoonfuls of a 'gravy' made from sweet potatoes and (we suspect) plum sauce, mixed with chili sauce, sesame seeds, and chopped peanuts. The lot is crowned with a few ruffled pieces of jellyfish. The result is a winner, crispy and crunchy and fresh-tasting, with a just a little bit of dietary evil (in the form of those deep-fried prawn crackers) thrown in. We'd probably opt for more chili next time, to better balance the sweetness of the sauce. 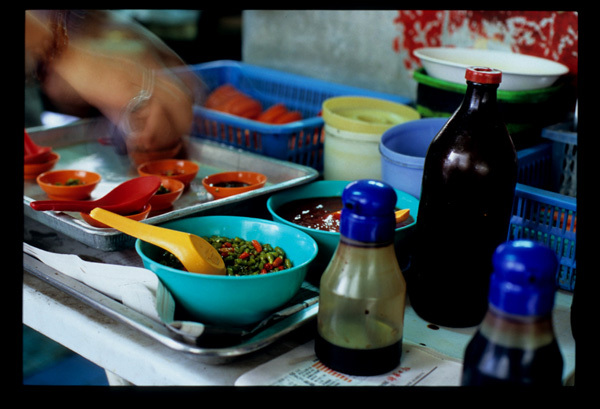 If you're going to go overboard - and really, in the gastronomic paradise that is Penang, is there any other way to eat? - this snack-sized dish heavy on the good-for-you ingredients is the one to do it with. Pasembur stall, Batu Lanchang food court (opposite the afternoon wet market), Penang. Afternoons. It's a Saturday morning in Penang and we're on a mission. 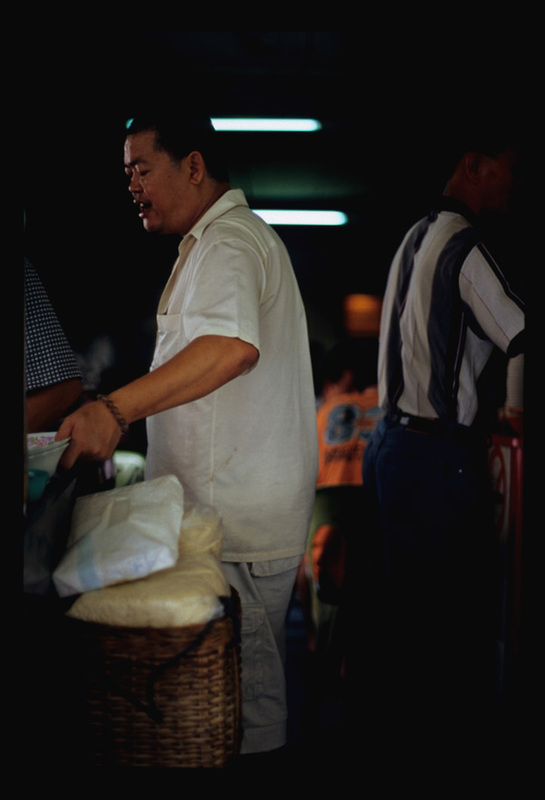 Back in June we walked up to this Nyonya kuih vendor's stall two mornings in a row, only to be told 'sold out'. Today, taking no chances, we arrive well before eight and are rewarded with two servings of kerabu beehoon, a tangle of rice vermicelli tossed with sambal belacan, calamansi juice, and chopped herbs. What's sold here isn't made by the vendor himself, but by an elderly Nyonya lady who learned to make the kerabu from her mother-in-law. The sweet kuih and bak chang (leaf-wrapped rice dumplings) also on offer here look tempting, but we know what we came for and we're sticking with it. Kerabu beehoon appeals to many of our culinary personalities. The chili hounds in us adores its heat (this version's is unusually high on the Scoville scale), while our Thai food-loving side is taken by its sweet-sour-salty calamansi juice dressing. 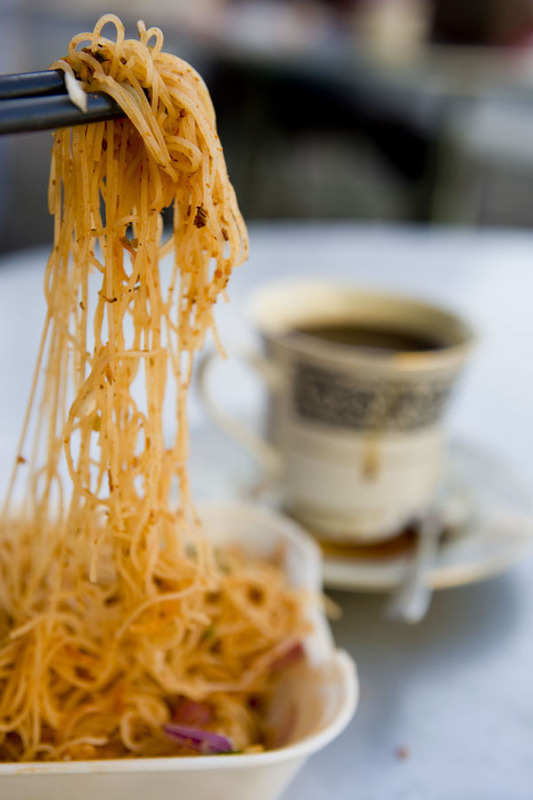 As noodle heads, we admire the springy, al dente texture of its beehoon. But perhaps more than anything else, it's this kerabu's pungently pervading sambal belacan-ness that makes the fan of fishy flavors in us swoon. 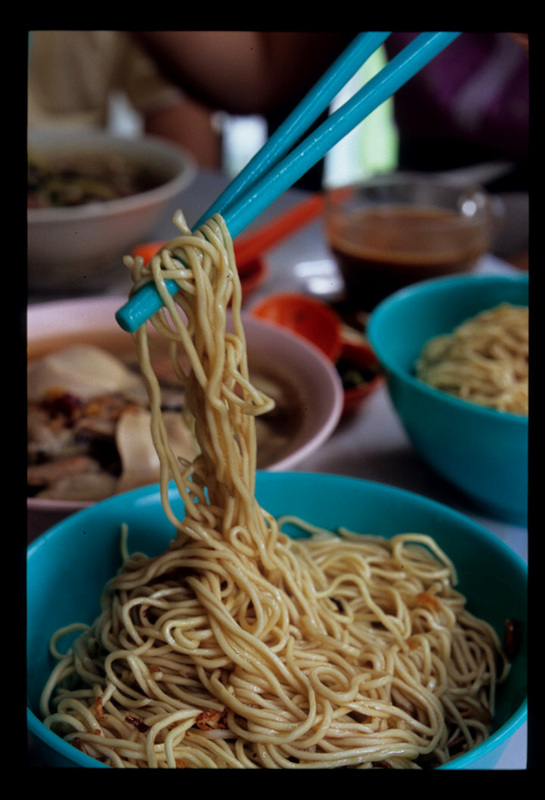 Practically speaking -as Westerners who have never really acclimated to Malaysia's sticky heat - we can't rate highly enough a noodle that packs a whollop of flavor without also delivering a faceful of steam. 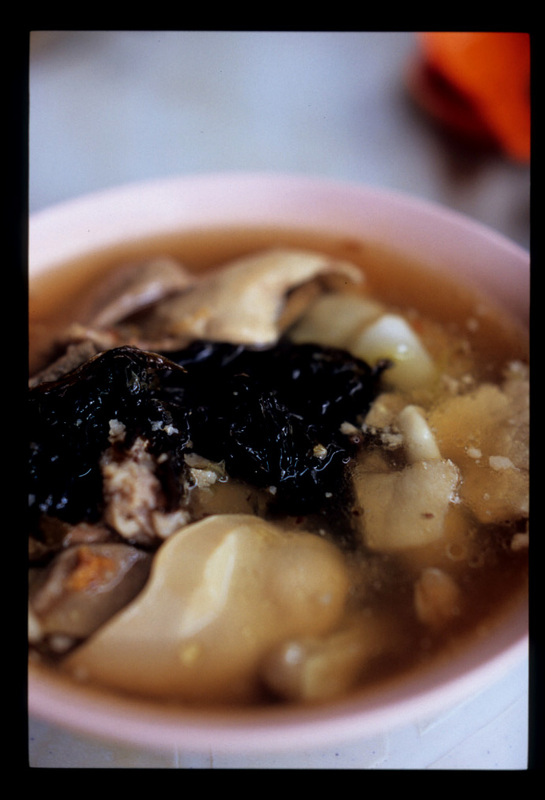 And let's not forget that we're in Penang, where limiting oneself to three meals a day is akin to heresy. Kerabu beehoon's light, almost salad-like nature makes for maximum enjoyment with limited impact upon the appetite. This version is a fine one, miles ahead of another we sampled last June elsewhere in Penang, better even than the one served from an otherwise stellar Nyonya stall we'll contentedly graze from in just another hour or so. The noodles, though minimally dressed, are fragrant with belacan and calamansi lime and boast herbal notes of torch ginger flower and mint. The flavors dance on our tongues (and continue to do so even after we're finished, thanks to chilies), leaving us both sated and wishing for more. Our moans of pleasured surprise inspire amusement among a few regulars at the next table. Behind the counter of the coffee shop that generously supplied us with chopsticks, the proprietor thoroughly enjoys us enjoying our beehoon. 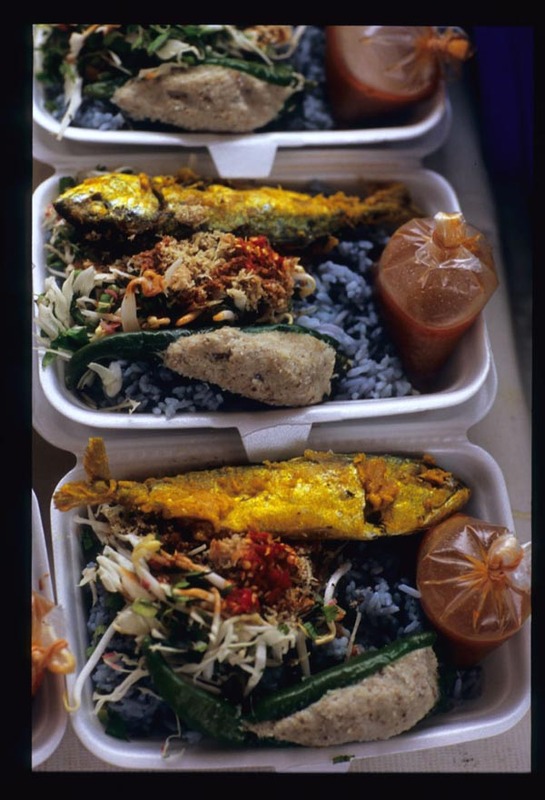 Kerabu beehoon at Nyonya kuih stall, in front of Hup Guan Cafe, 46 Jalan Cantonment, Penang. 7a-noon or until sold out. Closed Monday. 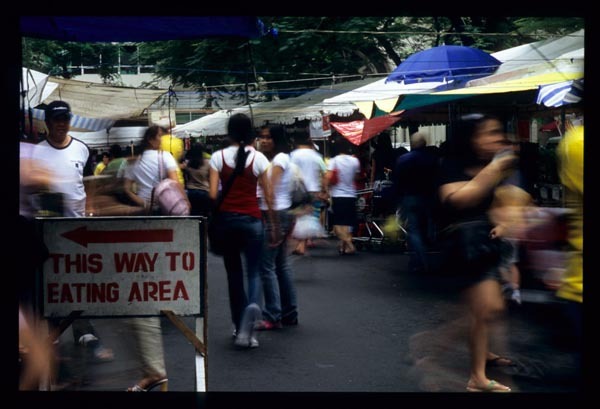 Philippine cuisine is Southeast Asia's most under-appreciated (except by Filipinos); it's probably for this reason that Salcedo Market, a once-a-week outdoor affair in Makati, Manila's business district, is so little known. 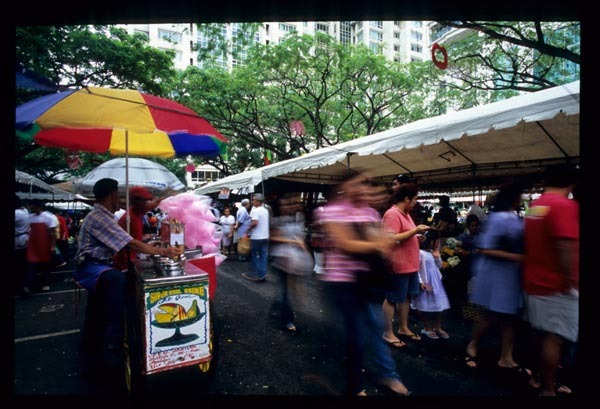 Were Salcedo - a juried collection of stalls offering a bounty of Philippine regional (and some international) foods - located in Singapore or Bangkok or Saigon it be known to Southeast Asia-bound globe-trotting foodies. 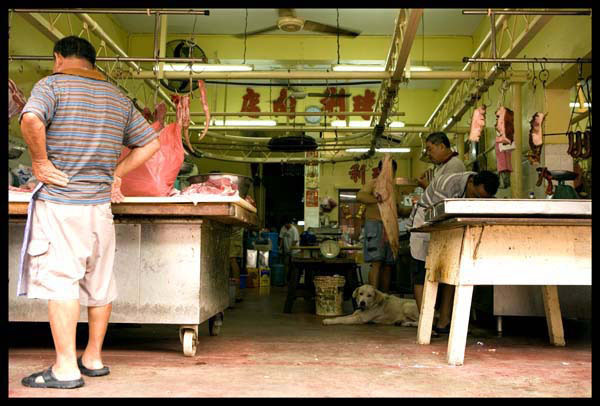 Instead it's bounty is left to the purvey of mostly locals, expats, and the occasional tourist. On this day Dave and I've come to Salcedo in search of neither lechon nor piaya (though we'll end up sampling plenty of each), but for bangus relleno: grilled milkfish, boned and stuffed with a mixture that includes its own chopped meat. Dave was lucky enough to nab some on a solo jaunt to Salcedo in February (while I lay in our hotel room, felled by the flu) and I've been waiting for a chance to partake. Alas, by the time we make our way to the front of the queue the relleno is sold out, and we're obliged to settle for milkfish stuffed merely with chopped vegetables. Yet as we soon find out, we're isn't 'settling' at all, for this version of grilled fish is a delicious dish in its own right. 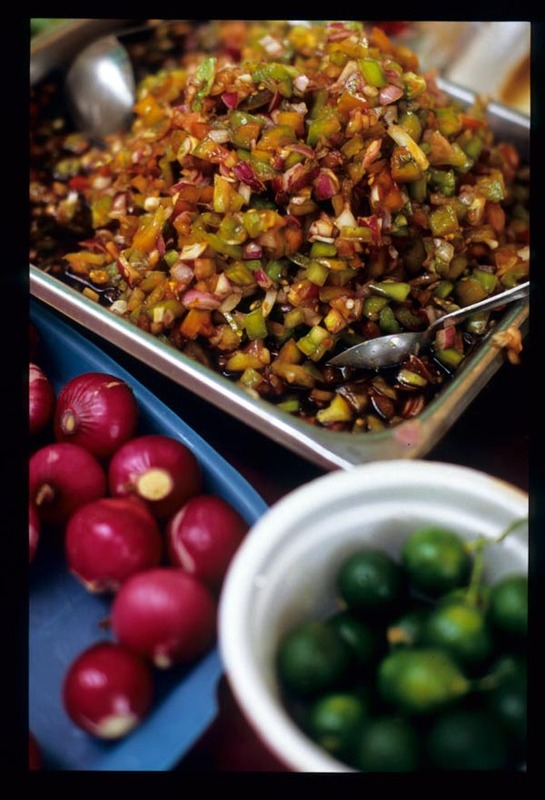 Dead simple to prepare, the dish starts with a mix of chopped red onions, green chilies, and tomatoes seasoned with dark soy, and kalamansi juice. The steps in the assembly line behind the grill fall in this order: the boned, butterflied fish is laid flat, skin side down, on a piece of banana leaf laid on top of a piece of tin foil. and spread with a generous mound of vegetables drained of their soy and kalamansi sauce. The fish is rolled tightly in its tin foil packet, but the head end is left open so that a ladel of sauce can be spooned in. Once the packet is completely sealed it spends about 15 minutes or so over the coals, the fish cooking away in all that lovely citrus-soy juice. The fish emerges from the packet moist, fragrant, and bit piquant from chilies and kalamansi, and the vegetables are perfectly cooked, the onions having lost their harshness, the tomatoes still holding a bit of shape, and the chilies toothsome. A little extra uncooked sauce on the side makes for a nice dipping sauce. 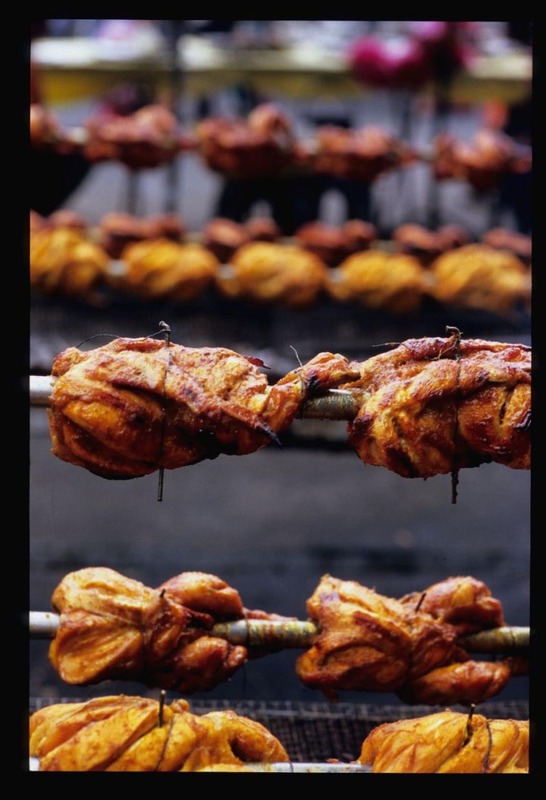 Hot-off-the-barbie fish bundles in hand, we stake out a position at one of Salcedo's crowded picnic tables and dig in. 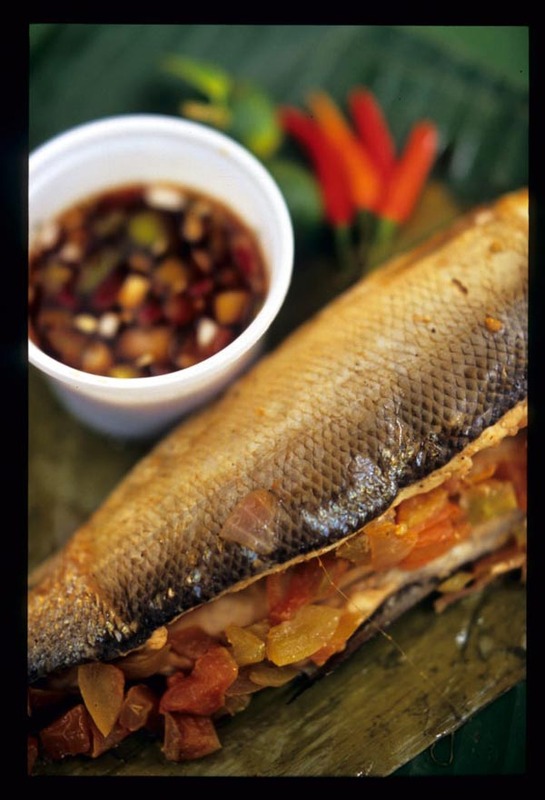 Most any firm-fleshed fish would do for the this recipe; at home we've used red snapper and mackerel. A completely boned, butterflied fish is ideal, but we've also done well with mostly-boned, backbone-intact specimens. The idea is to create as much space in the belly of the fish as possible, because the more stuffing, the better. This is not a dish that calls for the tastiest, juiciest, heirloom tomatoes. For this recipe, use firm tomatoes with a bit of tartness - green tomatoes would even work. Chilies should not be overwhelmingly fiery - you don't want to overpower the taste of the fish. We like more heat than most, achieved in this dish by chopping up a few bird chilies and adding them to the leftover raw vegetables-dipping sauce. We also found a bit of chopped coriander to be a nice addition. If it's not grilling weather bake the fish in the oven, at around 220C or 400F for 15-20 minutes, depending on the size of your fish. 1. Mix together the tomatoes, onion, garlic, mild chilies, sugar, soy, and kalamansi juice and allow to sit for 14 minutes. Taste for saltiness and tartness, add soy and/or kalamansi or sugar if necessary. 2. Spread a piece of tin foil (doubled over, if not heavy-duty) big enough to enclose the fish on your countertop, shiny side up. 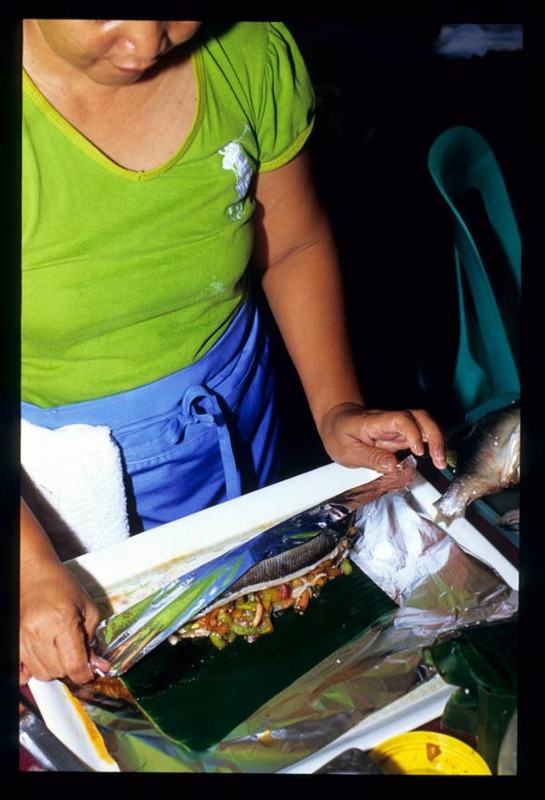 Place banana leaf, if using, cut to width of body of fish in middle of foil. (If not using banana leaf, very thinly coat tin foil with cooking oil. 3. 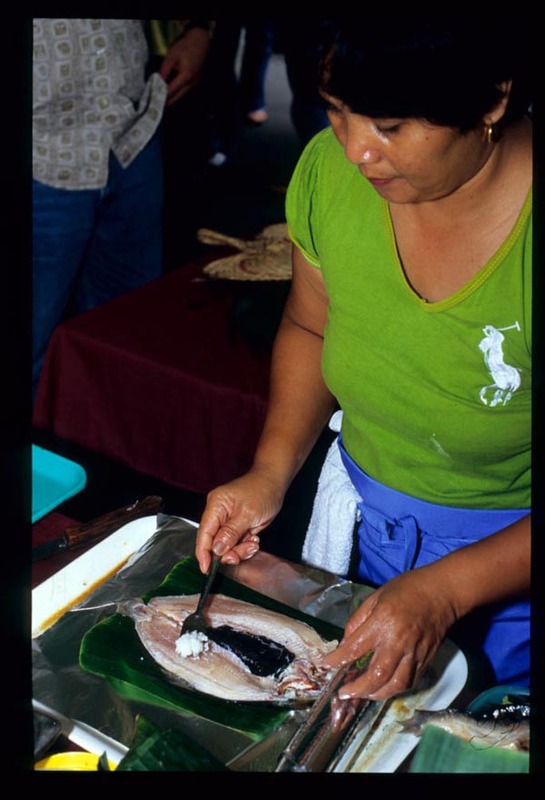 Place the fish on the foil or leaf (skin side down, if butterflied) and rub its flesh with salt; follow with kalamansi juice. 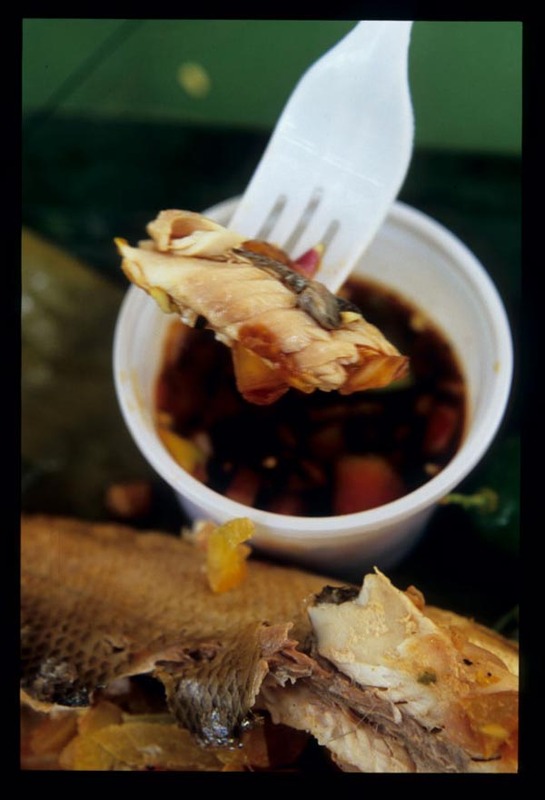 If fish is butterflied, mound filling (drained and juice reserved or spooned from bowl with a strainer) over fish almost to edges. If the fish isn't butterflied, fill it with as much drained stuffing as it will hold without gaping open too wide. 4. Wrap the fish tightly on all but the head end. Hold the package upright and pour in a generous spoonful or two of sauce. Close the head end tightly. 5. Grill, turning 3 times, 15-20 minutes (depending on size of fish) or bake 15-20 minutes at 400F (220C), turning once. 6. Optional: While the fish is cooking stir chopped cilantro and/or chopped hot chilies into leftover sauce. 7. Serve with rice (the fish is also tasty with a nice crusty baguette! ), dipping sauce and kalamansi or lime wedges on the side. We've walked by this place at least fifty times. Padang is a smallish town, easily done on foot. Soto Simpang Karya sits at one corner of the roughly triangular route we trod several times a day from guesthouse to market to seaside and back again. Open morning to late at night, it's always fronted by a solid row of motorcycles, doing a steady business. When we pass the place we slow a bit, and Dave says, 'We gotta try that place.' I say, 'That must be some tasty soto.' And we keep walking. 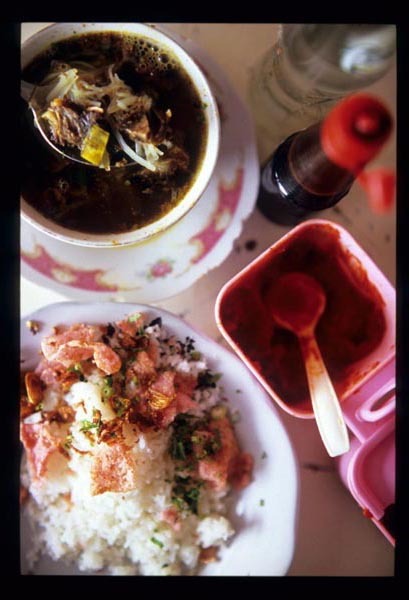 It's hard to get excited about soto, a brothy meat dish found, in a variety of incarnations, all over Indonesia. We're in the home of the mind-boggling buffet that is nasi Padang, after all. 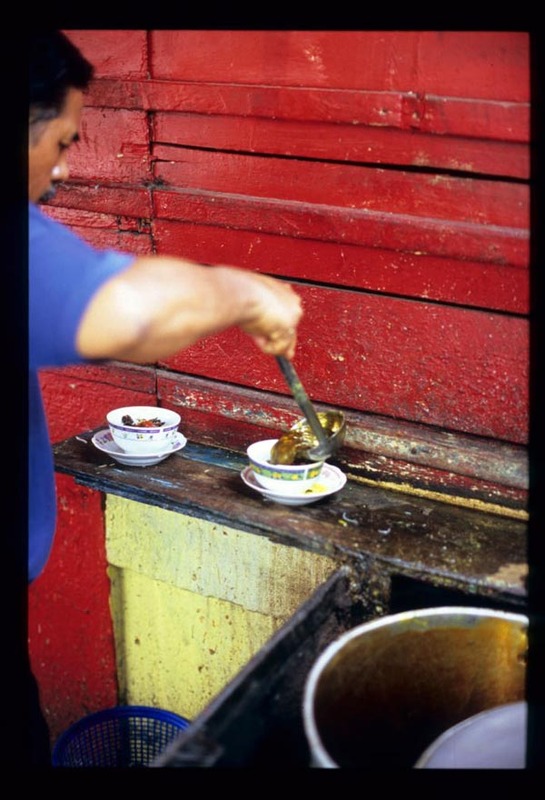 Around every corner there's a stick or five of spicy Padang-style sate with our names on it. A noodle to end all noodles is up the street (it comes with a nice sunset view), and a magical bubur is served just around the corner - with a side of strong coffee to boot. But this morning the oppressive heat is lightened by a breeze, and as we pass Simpang Karya it shifts direction ever so slightly, carrying the scent of soto right to our nostrils. The market can wait. It's time for breakfast. And so it is. Chunks of tender, smoky beef carved off a knobby hunk. A dash of vinegar, a splodge of chili sauce, a drizzle of kecap manis. Rice vermicelli and bits of pergedel, a chewy fried cake of rice and corn that absorbs the deep meaty broth, fragrant with all those spices usually associated with Indonesia - nutmeg, cloves, cinammon - and then some, that's ladeled over all. Served with a plate of room-temperature rice topped with crunchy rice chips and chopped cilantro, it's a brilliant mix of textures and temperatures. We splash a bit of broth on rice, then transfer a spoonful of rice to broth, then pluck out pieces of beef and beehon to eat with chips, all the while adding dribs and drabs of chili paste (which is, in Sumatran style, nothing but fresh red chilies ground with salt) and a drop or two more vinegar. We're departing Padang in a few hours, and there'll be no chance of a repeat soto. What idiots we've been. Before we leave Dave turns his camera on Auggie (that's how it sounds, but probably not how it's spelled), a server who's been watching us intently from a rear corner of the shop. At first he's all supercool and composed, doing his jaded Indonesian teen thing. Then he starts to loosen up. Finally, he finds it difficult to take us - or himself - too seriously. Dave and his camera seem to have this effect on people. Note: We're wondering how Soto Simpang Karya (and the rest of Padang) weathered the September quake off southern Sumatra. If anyone's been recently, please drop us an email. 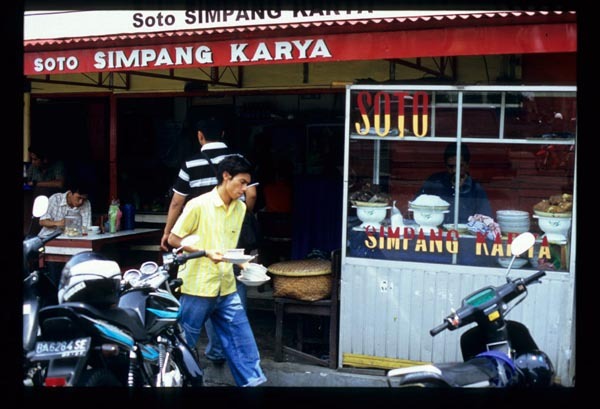 Soto Simpang Karya, Jalan Pondok, Padang, Sumatra (Indonesia). Morning to night. No off days. 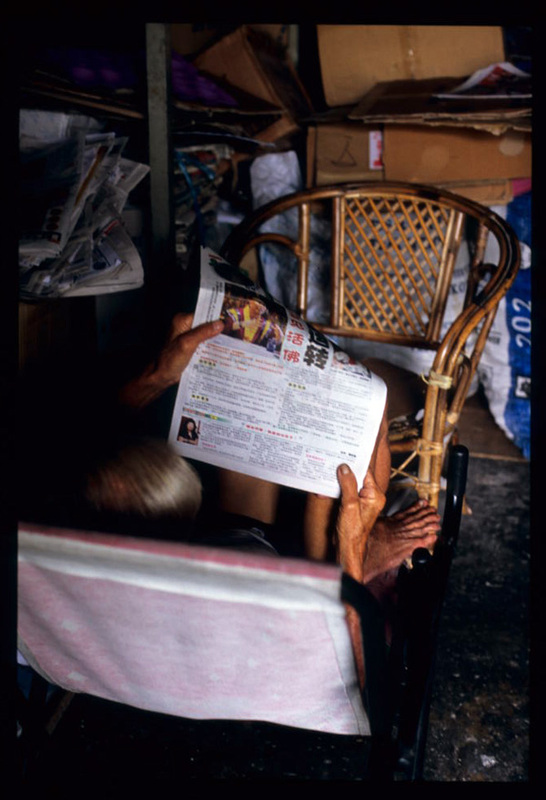 Many of Kuching's decades-old shop houses accomodate decades-long residents. Chinatown (the clutch of guest houses at one end of Carpenter Street notwithstanding) is still chockabloc with small businesses (a tinsmith, a coffin maker), coffeeshops, and multi generation-run eateries. 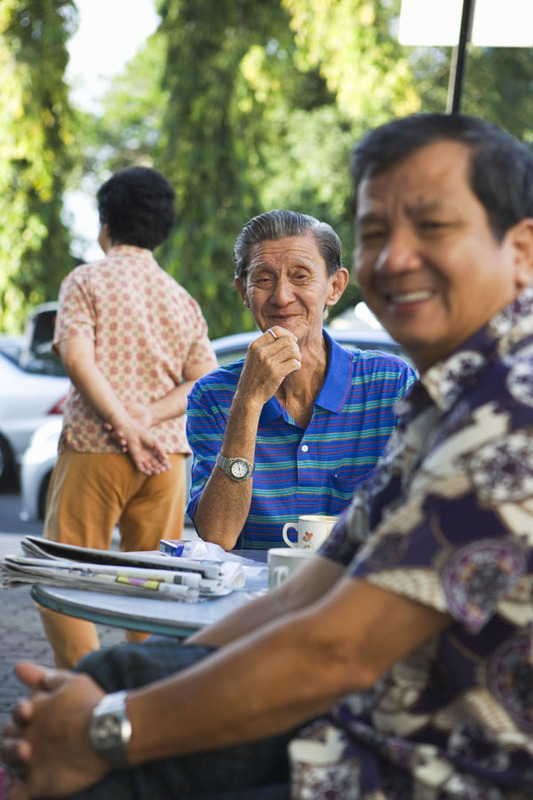 And though some of the colorful shop houses on Jalan Padungan, near the western end of the city's riverfront promenade, have been transformed into smart bars and cafes, others still house unassuming family-run food enterprises. 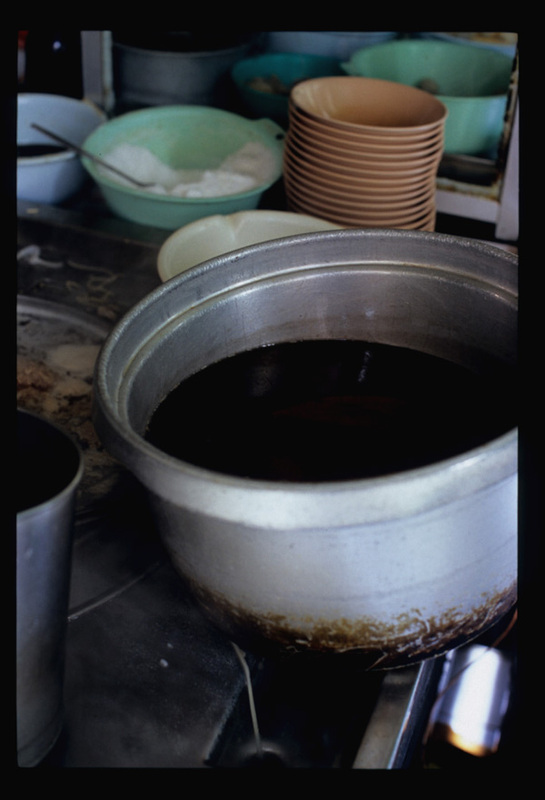 Worn wooden trays laden with irregularly shaped coils of golden noodles alerted us to the presence of one such business, Seng Ngee Foh. 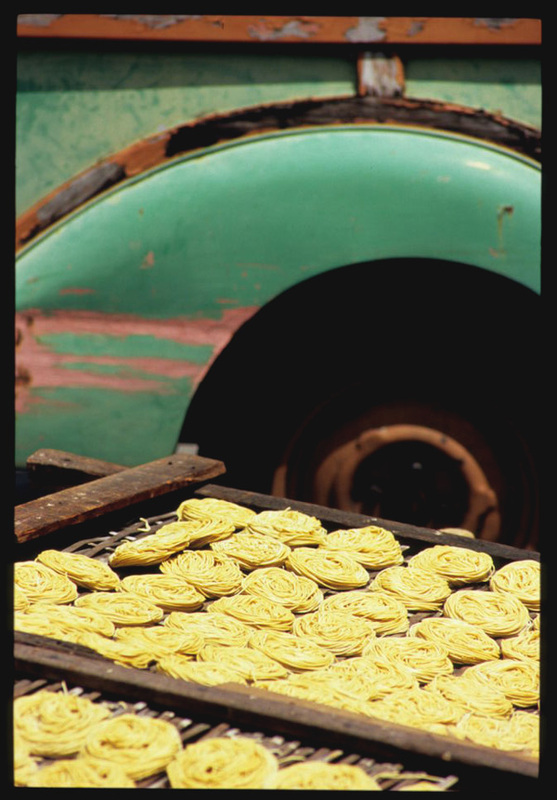 We'd walked past the shop's quietly anonymous Jalan Pandungan front with nary a second glance and then, turning into the parking lot behind, beheld this bounty drying in the sun. We circled the block again and poked our heads through the small gap between Number 148's folding doors. 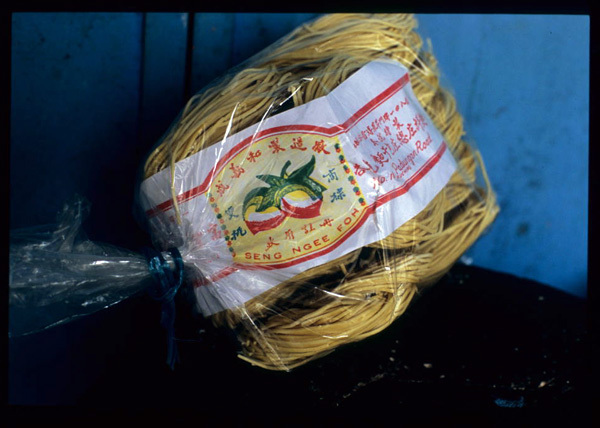 Cellophane-packaged noodles sat in a pile on a table near the front of the long, narrow space; in the back, we spied noodle makings. 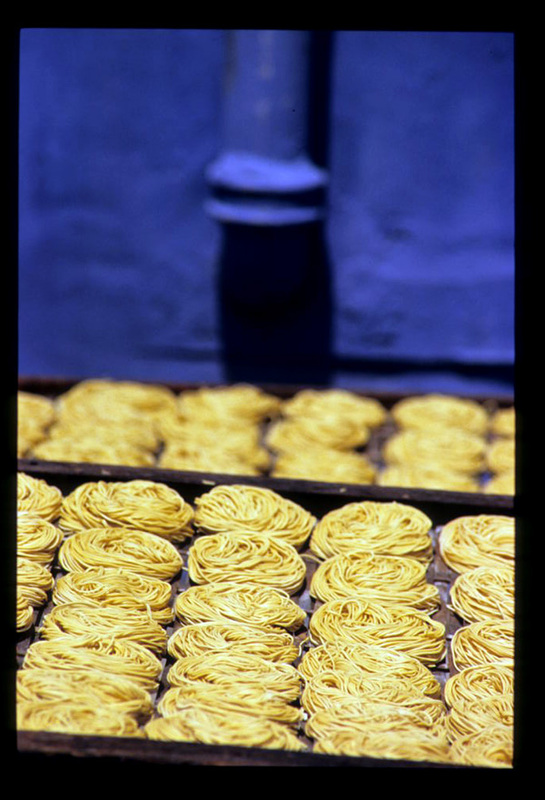 Egg noodles have been made here for forty years; the man who started the business still tends to the noodles with the help of his children and, now, theirs. Things get going at 8am; noodles are set out back to dry around 10 and brought inside and packaged at the end of the day. Every Monday through Saturday, mixing and processing and shaping and drying and packaging happen here, in (and out back of) one small shop. Regular readers know we're suckers for a good artisinal food story, but in the end flavor is what matters. Seng Ngee Foh's noodles are as good as they look, substantial (each coil weighs about 4 ounces), smooth with a good bite, and richly eggy. After boiling up a couple of coils and hanging our heads in the yolky steam that rose from our bowls, we dressed them simply with a few drops of good quality toasted sesame oil, a drizzle of dark soy, and a splash of black vinegar. Next time we'll add ginger and garlic, chili oil and Sichuan peppercorns, bean sprouts and shredded chicken, or enjoy them with an anise-scented, red-cooked beef stew ladeled on top. Here's to Seng Ngee Foh's third generation. Seng Ngee Foh, No. 148 Padungan Road, Kuching. Tel. 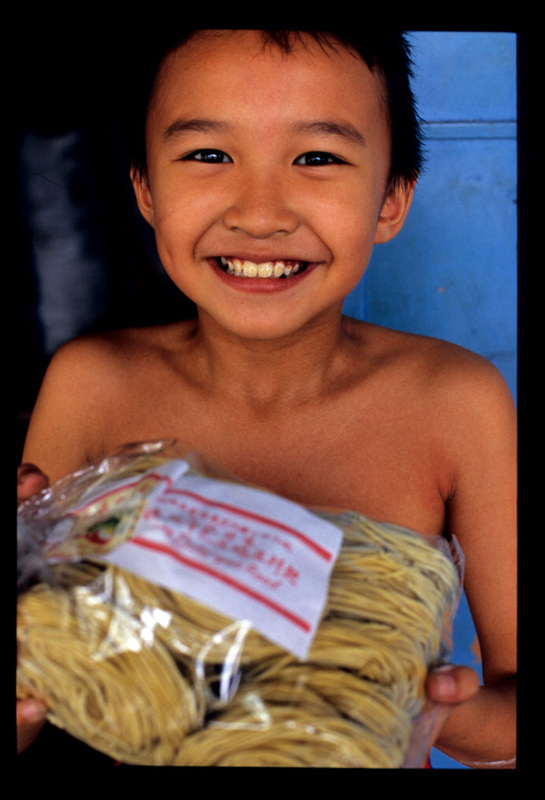 241471.A two-pound package of noodles costs 3 ringgit. Combine all dressing ingredients except the Sichuan peppercorns and chili oil sludge (if using), stir or whisk to dissolve the sugar. Add the sludge and peppercorns; taste for heat and sourness, adjusting with additional vinegar or sugar or chili oil if necessary. Set aside while you cook the noodles. Cook the noodles until just al dente, drain and plunge into cold water to stop the cooking. 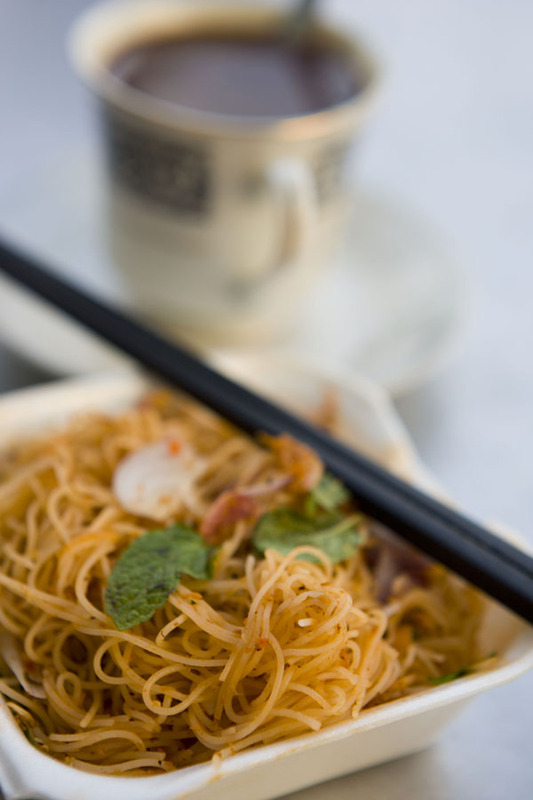 Drain again and toss with sesame oil (use your hands to avoid mushing noodles). Toss the noodles with the dressing and set aside for about 10 minutes. Add vegetables and scallions, toss again, and serve at room temperature. Unless you want to come off as a tourist, that is (not that we'll ever be mistaken for locals). 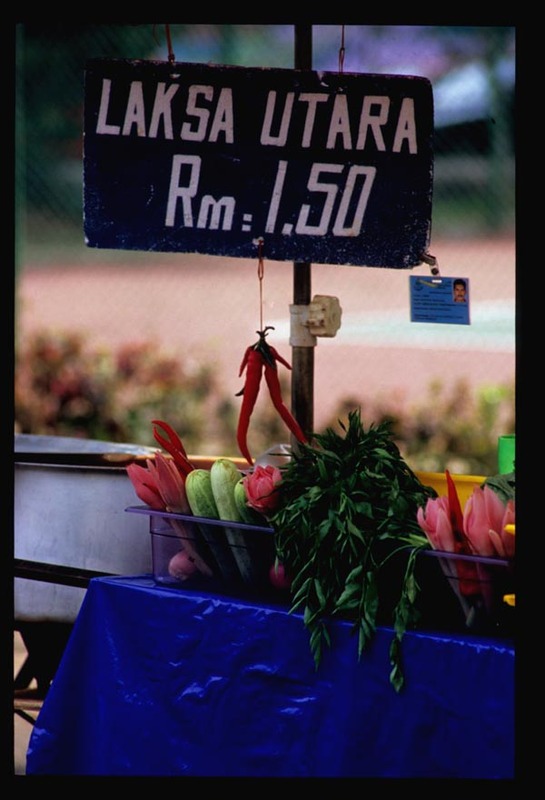 Malaysia is the land of laksas. There's laksa assam and curry laksa, Johor laksa and laksa utara. 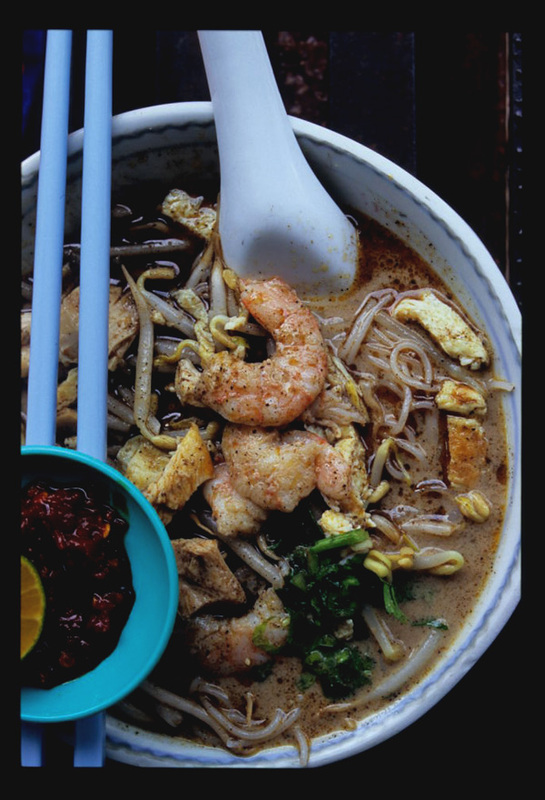 And Sarawak laksa, which in Sarawak is known simply as 'laksa'. 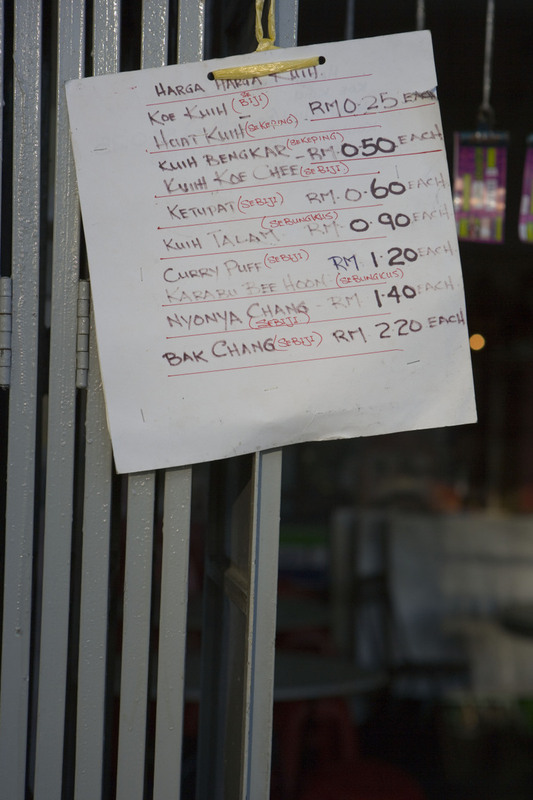 Local-style laksa rules in Kuching; cruising around the small city's streets, we didn't see a single hawker offering any kind of laksa other than, well, laksa. That's fine with us, because in Kuching we can - and did - eat laksa day after day. Coconut milk-based Sarawak-style laksa gravy incorporates a spice paste made from belacan, lemongrass, galangal, coriander, chile, and black pepper, among other things (Sarawak laksa recipes are hard to come by). Into the gravy go beehoon (rice vermicelli) and bean sprouts; shrimp, chicken, omelet strips, and fresh cilantro crown the bowl. On a dull, rainy Saturday we found our laksa heaven at Min Heng, a small Chinese coffee shop just a couple of blocks from Min Joo. 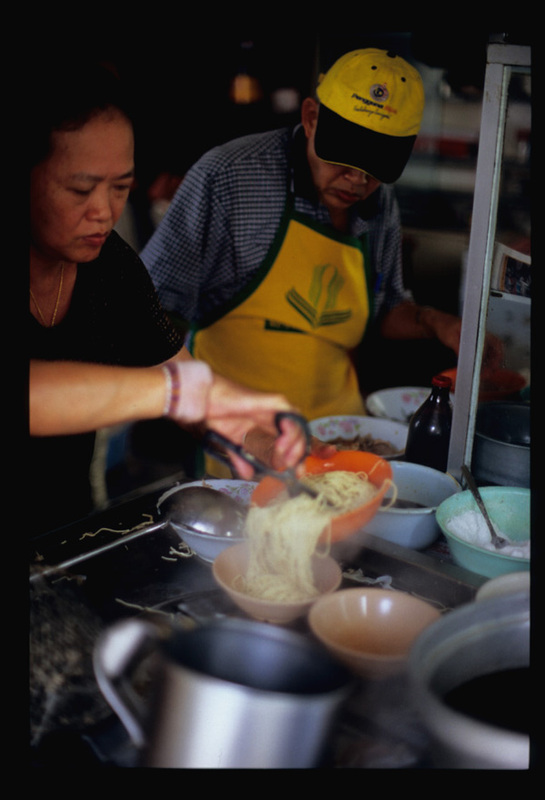 Laksa is breakfast fare in Sarawk (most vendors are closed before lunch) and, indeed, at 8am this stall owner and his wife were serving several tables of regulars and while fielding dozens of takeout orders. She told us that on Sundays their packing it up by 9:30am. This couple's attention to detail comes through in the final product. His soup, fully lemak (rich with coconut milk), is, at the same time, light. Black pepper comes through clear and strong on the palate, as does ground coriander and lemongrass, and chile takes a back seat - until, that is, the accompanying sambal is stirred in. With the addition of a squeeze of kalamansi the gravy assumes a perfect balance, coconut milk's sweetness playing off citrus tartness and acting as the perfect foil to the kick of black pepper and red chile. 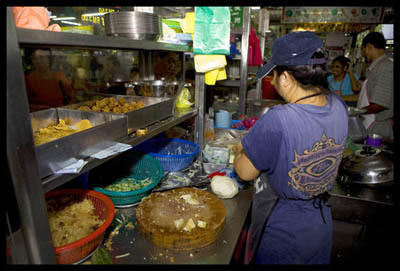 This laksa cook doesn't prepare his chicken in advance but keeps it on the bone, poaching in a pan of stock on his cart, ready to be pulled out and chopped to order (note the whole chicken lower right, above). 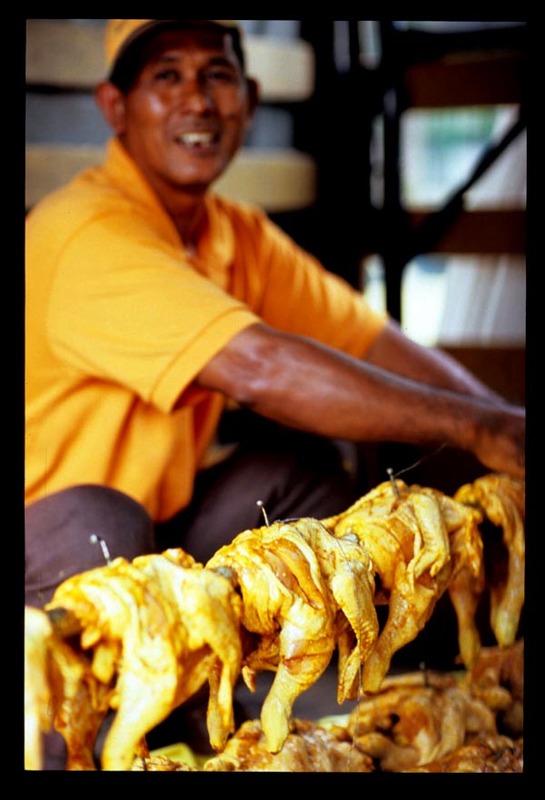 The result is juicy, flavorful pieces of bird rather than the rubbery bits of protein to be found in many a Sarawak-style laksa. His wide omelet strips taste fresh and eggy, and he's generous with shrimp as well. 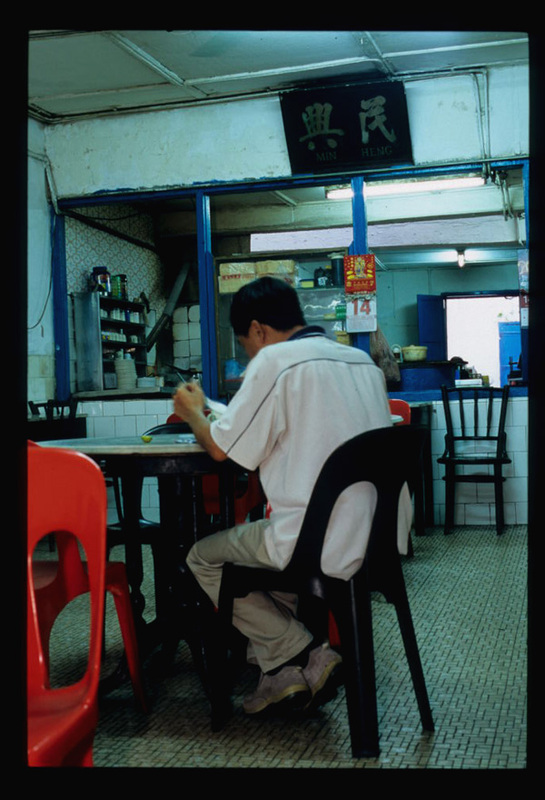 Satisfied as we were with our this laksa at Min Heng, we felt compelled - for our readers - to sample the version served by an elderly hawker almost kitty corner, in an open food court across from the Carpenter Street Teochew temple. 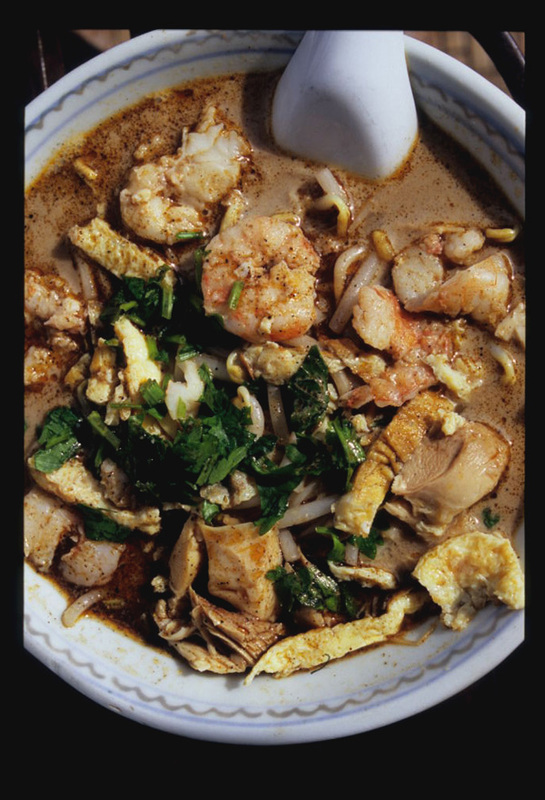 It boasted little of our previous laksa's subtlety and seemed heavy with coconut milk in comparison. Neither sambal nor kalamansi was served on the side; a polite inquiry ('Sambal?') earned us a grunt, a sneer, and a jerk of the vendor's thumb at our bowl. Now, we can certainly appreciate that a proud cook may not wish a diner to mess with his creation. 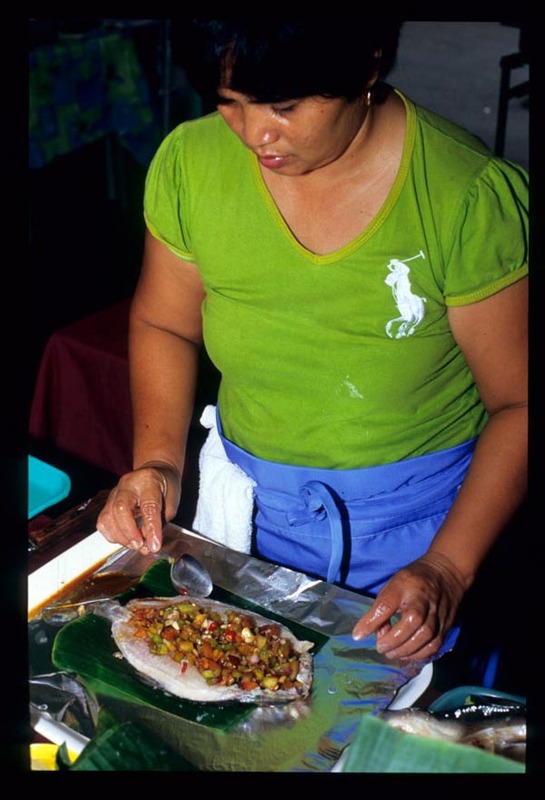 But in Malaysia, where some like it fiery, others like just a touch of tingle, and the rest prefer it blandish, heat on the side (in the form of sambal, chile sauce, and/or pickled/fresh chilies) is ubiquitous. 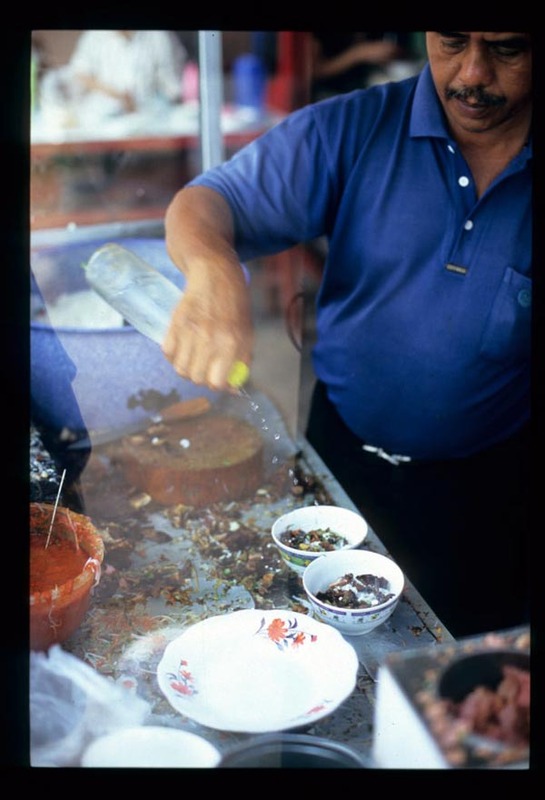 This vendor's refusal to come up with a saucer of sambal seemed born more of orneriness than genuine insult. The next morning we returned to Min Heng. And just in time, too. It was 9am and we were among the last customers of the day. 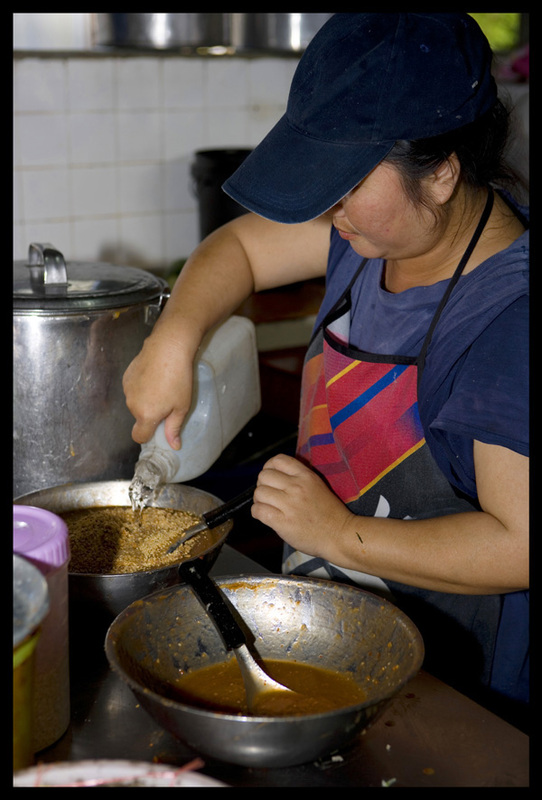 Laksa stall at Min Heng Cafe, 6 Carpenter Street, Kuching, Sarawak. Mon-Sat 7-1030 or 11a, Sun 7-9 or 930a. No set off day. (This shop serves a nice cup of kopi too.) 3 RM per bowl. 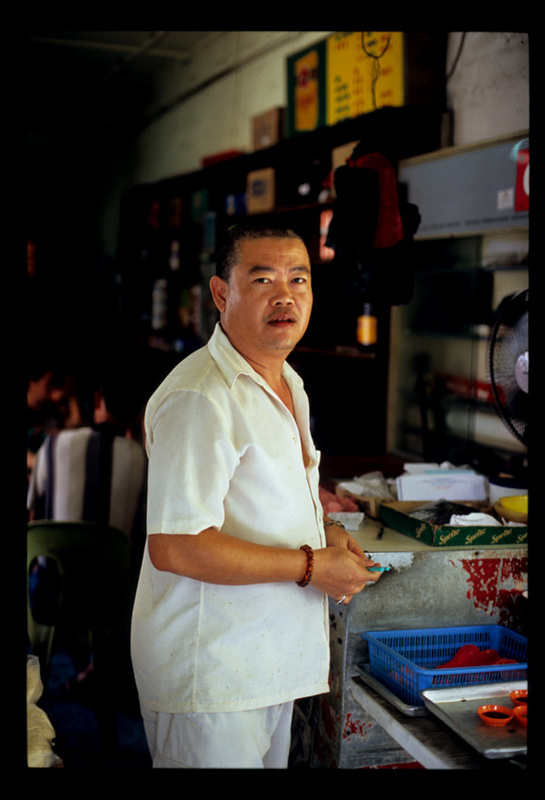 Should you find yourself in Kuching, get to know this man. 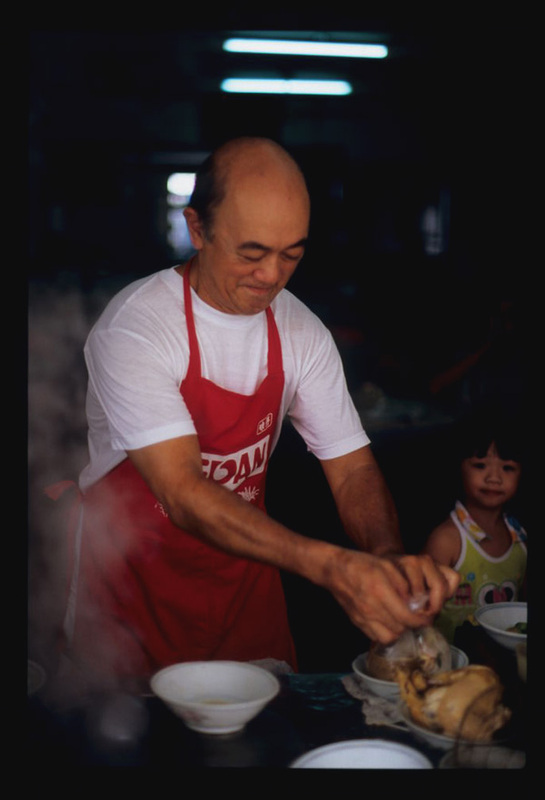 And be nice to him, because he stands between you and what may well be the most sublime bowl of noodles in all of Malaysia. 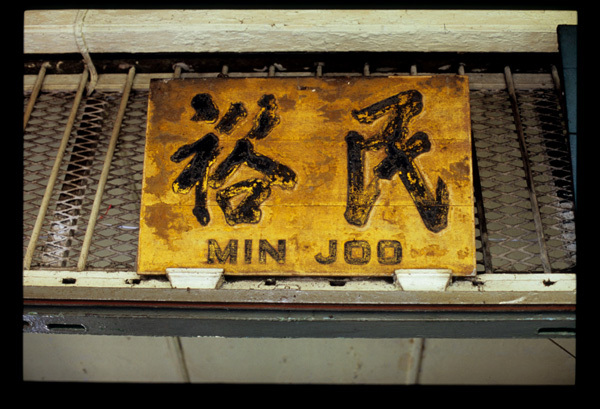 Arrive at Min Joo, in Kuching's Chinatown, expecting a wait. This half century-old tiny corner shop, with only two tables outside and three or four within, heaves with customers opening to closing. Would-be diners hover at its edges, jealously eyeing the progress of those already eating while silently laying claim to their chairs. Seating is China-style - no queue, in other words - so when a chair is vacated move it or lose it. A politely uttered 'I think I was here first' may prompt an impatient interloper to hand over the space that should, by all rights, have been yours. 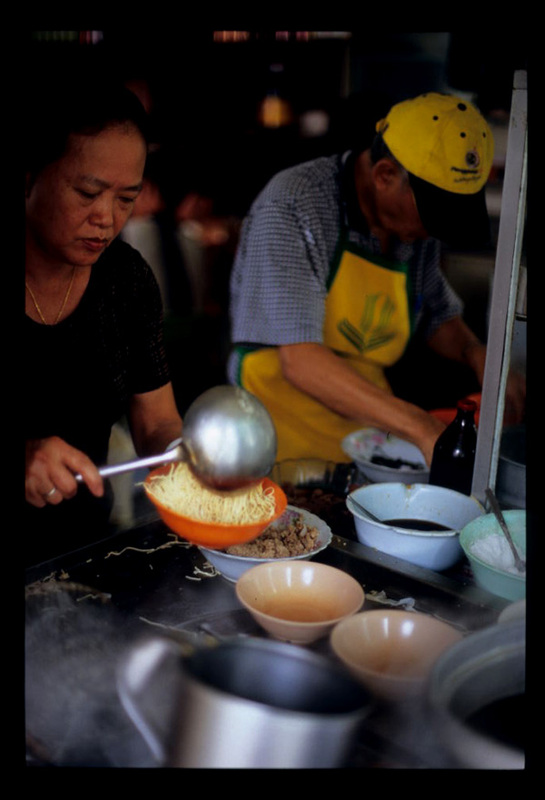 The draw here is mee kolok, a Kuching specialty of flat-and-wide or round-and-thin noodles tossed with soy and lard and topped with pork three ways: charred (char siew), chopped, and stewed-and-sliced. 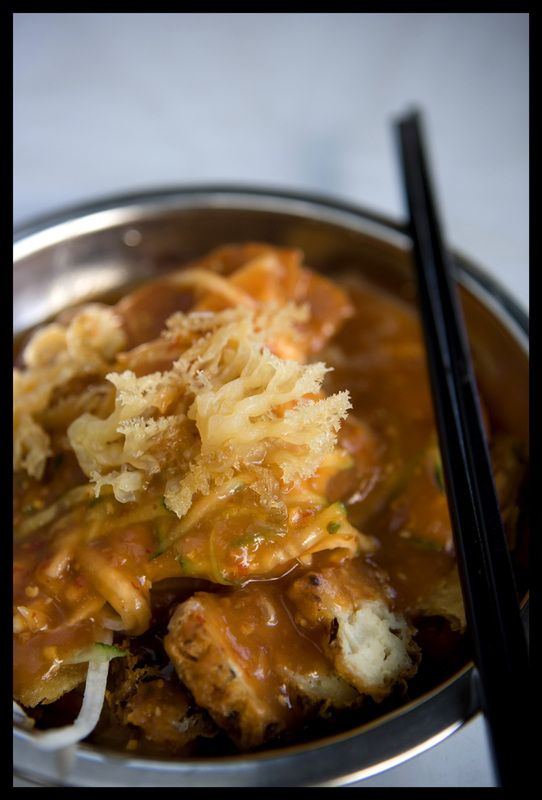 Jin Moo's version features top-notch fresh pasta and is especially fragrant with the fat of the pig. During peak hours (mid-morning, especially on weekends), as the orders pile up and customers and would-be customers jostle for space with servers, things can get a little crazy. That's where Mr. X comes in. Taking and giving orders with the staccato bark of a drill seargent, all the while maintaining an at-the-ready supply of soy and chile-filled condiment saucers, he keeps chaos at bay. At Min Joo it's important to observe protocol. First, don't expect to be seated. Mr. X is likely aware that your presence well preceded that of the barrel-shaped, sharp-elbowed aunty, but he'll not intervene when she pole-vaults across two tables to plant her rear in the chair you've been staking out for half an hour. At Min Joo the rule of the jungle prevails; you gotta fight (in a polite, understated sort of way) for your right to eat. Second - do not, in your eagerness to place an order, raise a hand - or even an eyebrow - at Mr. X or anyone else. Min Joo is a bit like elementary school: you may speak when called upon. This is no cause for vexation, for Mr. X's eagle eye has registered the moment at which you sat down and you'll be asked what you'd like to eat in proper order, relative to other diners. 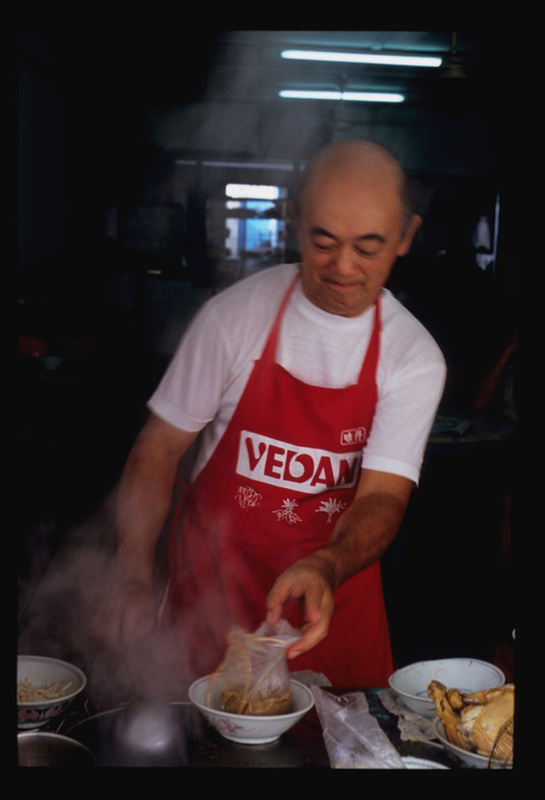 Though you may keel over from hunger or torment, or both, as you wait your turn while watching others blissfully shovel in Min Joo's sinfully lard-coated noodles, never fear, for once Mr. X has heard your wishes vittles will arrive shortly. Pass idle moments by observing the action at the shop's front prep area. Here, a gentleman with permanently hunched shoulders - Mr. X Sr., perhaps - and a woman with an ever serious mien, both seemingly glued to their spots behind the glass, seamlessly and without pause pull together order after order after order. Into a bowl go a splash of soy, a glug of dark vinegar, and - dished up from a large pot at the center of the work area - an extremely generous amount of lard. Noodles fresh from the boiler are piled on top and the lot is deftly mixed and tossed with a ladle almost as large as the bowl. The elastic noodles are then apportioned, with the help of scissors, into awaiting serving vessels. There are several options here. 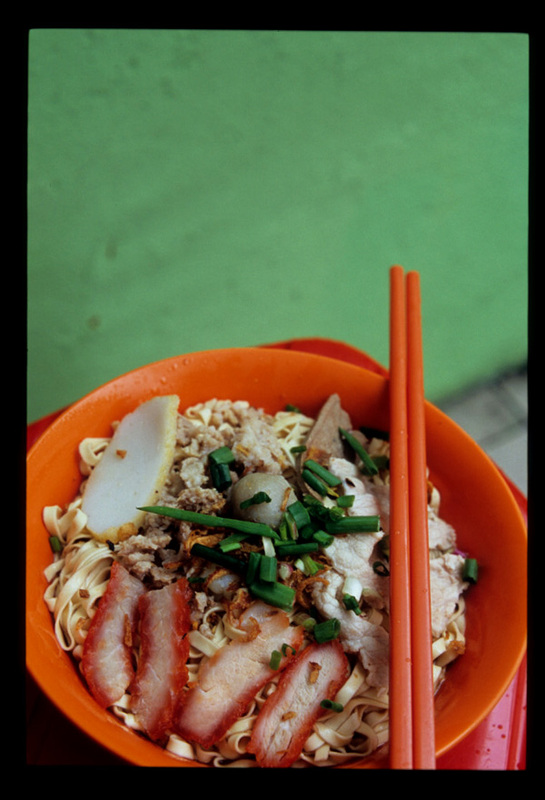 A request for kolok mee with wide noodles will net you a mound of pasta topped with three-ways pork (plus a pork ball), sliced fish cake, a piece of innnard or two, and chopped scallions (seven photos up, green background). The fettucine-like noodles are beyond reproach - eggy and chewy, cooked al dente - and the array of pork toppings flavorful to a one. But most of Min Joo's customers order their thin kolok mee kosong (plain), and it must be said that these strands of pasta bare of solid pork serve well to focus attention on their fantastic springiness larded almost, but not quite, to excess. 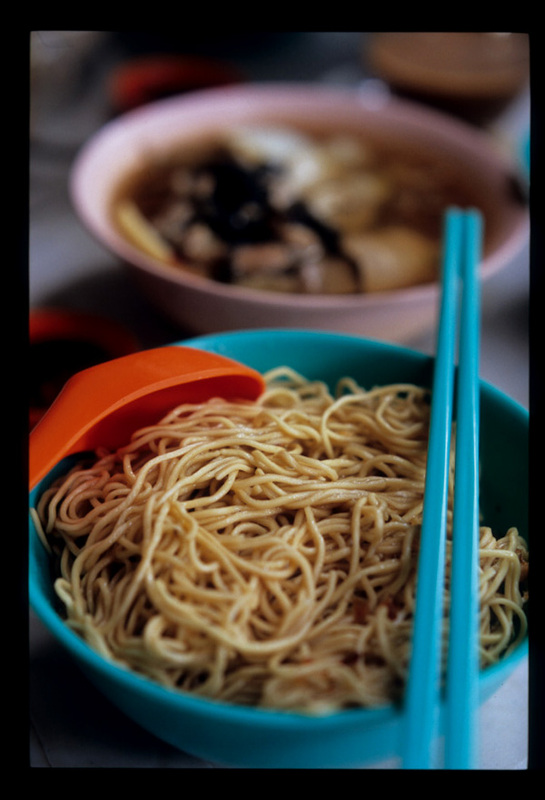 Kolok mee kosong are best accompanied by Min Joo's 'vegetable soup'. Vegetarians, or anyone looking for a healthy dose of fiber, be forewarned: the only sign of produce in this bowl is a murky green blob of pleasantly briney seaweed and a few slivers of preserved salted vegetable. In our book pork balls, belly, kidney, liver, stomach and intestine (as well a small prawn or two) don't qualify as produce. Neither is there a trace of veggie flavor in the full-on meat broth. But Min Joo's noodles are so fine, and their 'vegetable soup' so slurp- (and chew-) worthy, that we're willing to cut the place some slack. Anyway, haven't you heard? Offal is the new bok choy. Min Joo, Carpenter Street (look for the packed out corner shop across from Bollywood Cafe), Kuching, Sarawak. 730a-3p. No phone, no fixed off days. We don't often add new blogs to our sidebar. Put it down, in part, to laziness, but also to a lack of time. Well, our daily reading list has recently expanded a bit. Phil of Cambodia food-focused Phnomenon has moved on to greener (?) pastures and has been drinking his way down the American West Coast and eating his way around Korea and Vietnam at The Last Appetite. 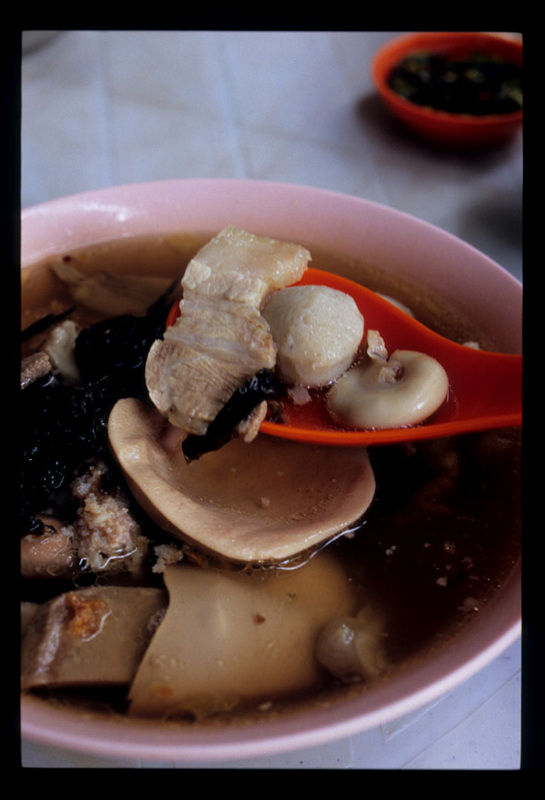 The anonymous farang in Bangkok who writes and photographs A Dish A Day investigates the city's snack scene and is about to embark on a bicycle tour of northern Thailand. 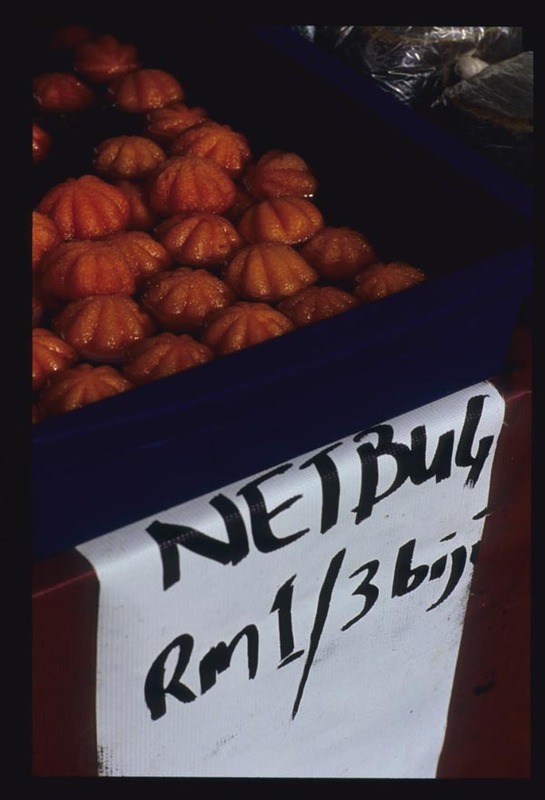 We love this blogger's unpretentious style and his/her focus on street foods; proof positive that - depite what some uber-famous traveling American chefs might have you believe - Thai street food does not begin and end with bugs. A former restaurant reviewer in Melbourne (soon to be Sydney) writes Elegant Sufficiency. She's smart and funny and a great foodie in the most non-obnoxious way, and, well, she's writing from Australia, which we reckon has some of the best ingredients on this earth. What's not to love? 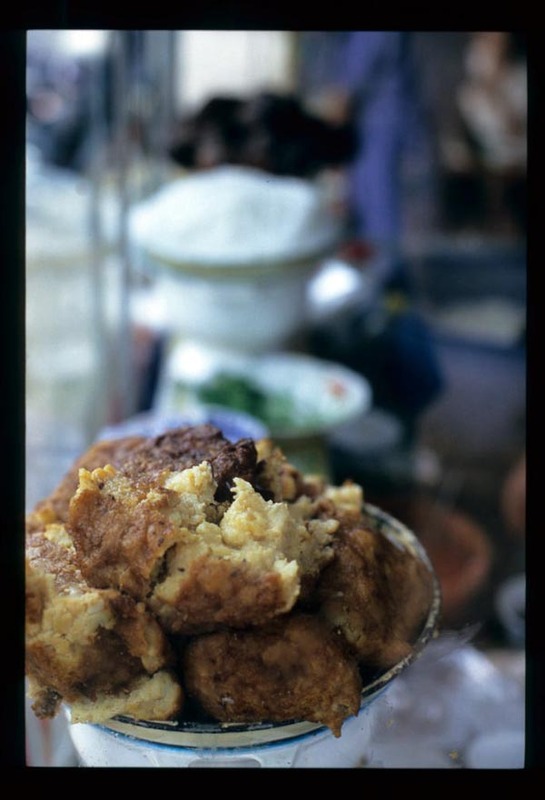 And then there's The Asian Grandmothers Cookbook, which we recently told you about here. If you're here via Culinate, welcome. We hope you'll have a look around and tell us what you think. For us, Ramadan began this year with a bag of bubur lumbuk(savory spiced rice porridge). On the first weekend of the Holy Month we headed to Kampung Baru, Kuala Lumpur's Malay 'village', in search of Ramadan bazaar excitement. We parked and walked .... and walked. We were lost in Kampung Baru's maze of streets and alleys. It began to mist. And then to rain. We had no umbrella. It was getting dark, too dark to get any photos. A wasted Sunday evening. Thus is the spirit of Ramadan. And of Malaysians. And for us, Ramadan came to a quiet close last Sunday, in Temerloh, a small town on the Pahang River about ninety minutes from downtown Kuala Lumpur. 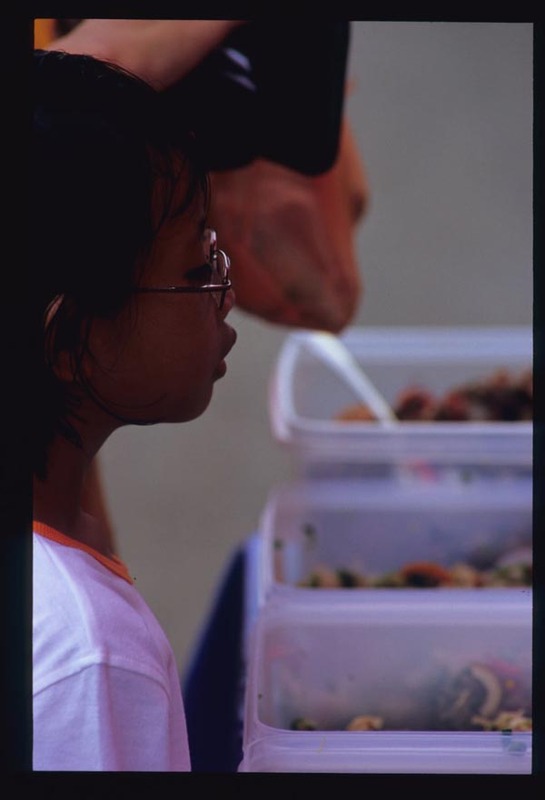 We'd spent a good portion of the three weeks that had elapsed since we received that gift of bubur from a perfect stranger investigating KL's Ramadan markets. In case you haven't heard, Ramadan is a wonderful time to visit many Muslim countries. We first learned such years ago in Istanbul, when we found that the end-of-the-day approach to the breaking of the fast brought a giddy joyfulness - and many vendors of wonderful Turkish specialties - to the streets. It's no different in Malaysia. As the afternoon light fades markets offering prepared food with which to break the fast sprout like mushrooms in a compost heap. 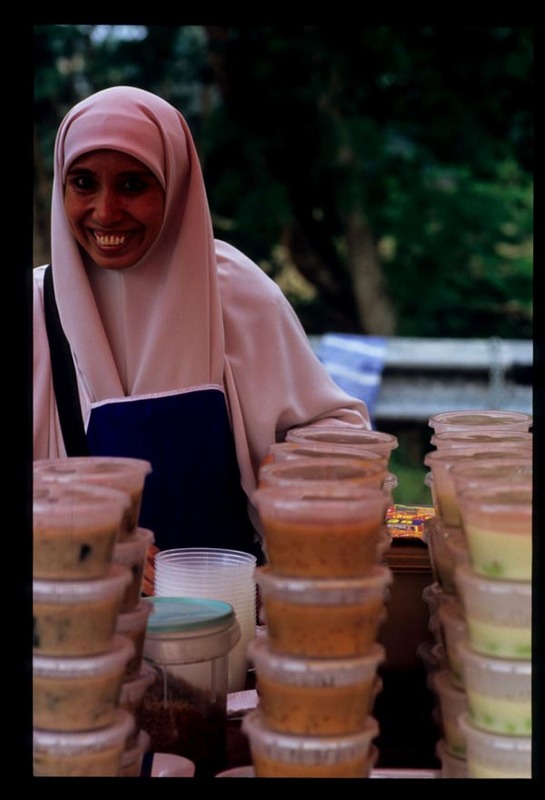 For us, being at a KL Ramadan market is akin to being the proverbial kids in a candy store. By last weekend, having already wandered and photographed many of the city's Ramadan markets, we decided to take to the road. 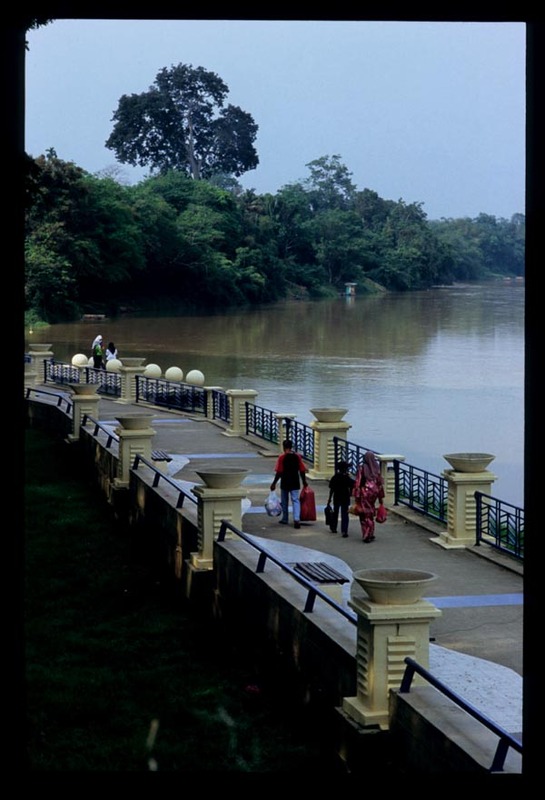 Temerloh, a mostly Malay town, seemed a logical destination. 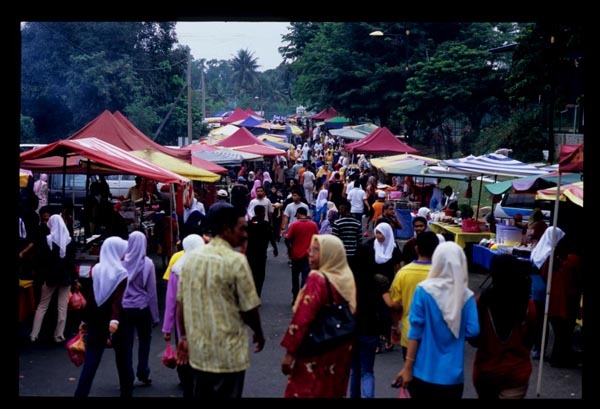 We love its Pekan Sehari (Sunday market), and figured its Ramadan bazaar would beat any we'd visited in KL. Initially we were a bit disappointed. We'd expected something along the lines of the huge Pekan Sehari, which stretches for more than a kilometer along the river. Temerloh's Ramadan bazaar was really rather small, even in comparison with some of the markets in KL. But we were quickly reminded that the Pekan Sehari's size is not its only attraction. It had been one and a half years since our last visit, and in that time we'd forgetten one of the things that makes the market such a pleasure to pass a morning in: Temerloh-ites. Lots of smiles, and a big welcome, everywhere we went. And actually, the size of Temerloh's Ramadan market turned out to be just right. 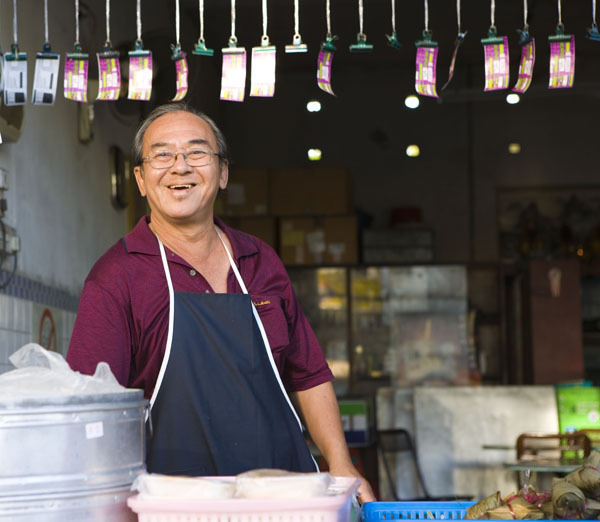 Big enough to host vendors not only from the area, but also from other parts of Malaysia, small enough to peruse at a leisurely pace once, twice, even three times, without fatigue (or blisters). One of his fragrant birds became the centerpiece of our Temerloh Ramadan market dinner. 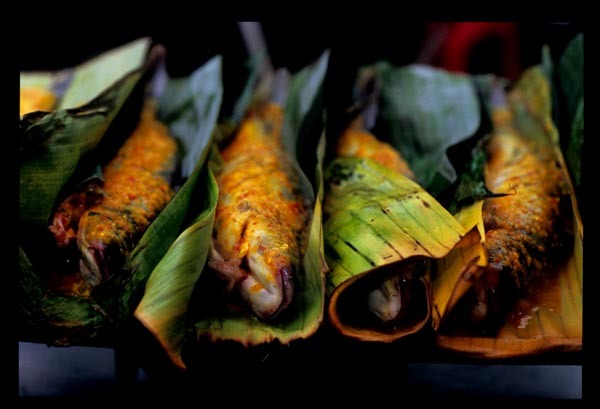 That, unfortunately, left no room in our market basket for another potential main course, and one not often seen in Kuala Lumpur: ikan bakar tempoyak (banana leaf-grilled fish rubbed with a chile and fermented durian paste). 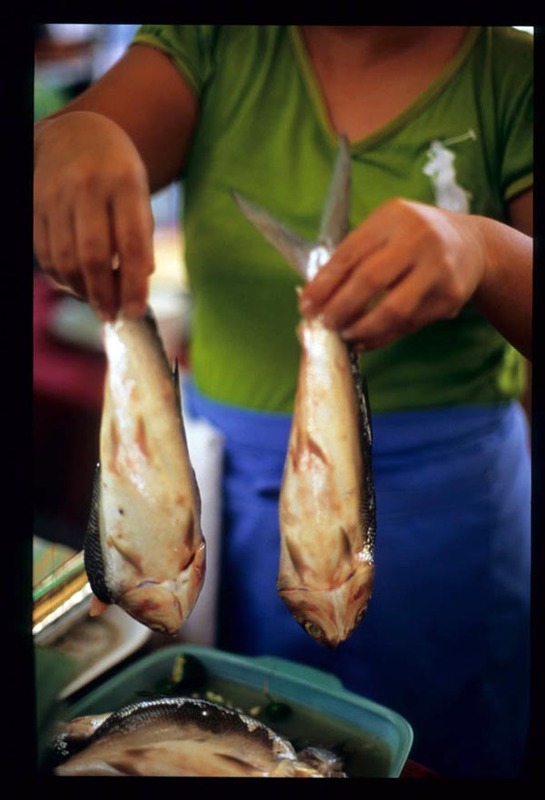 Catfish are raised nearby in the Pahang river, and these specimens smelled heavenly. One of the first stalls to catch our eye as we entered the market was this one run by a couple from Narathiwat, in southern Thailand. 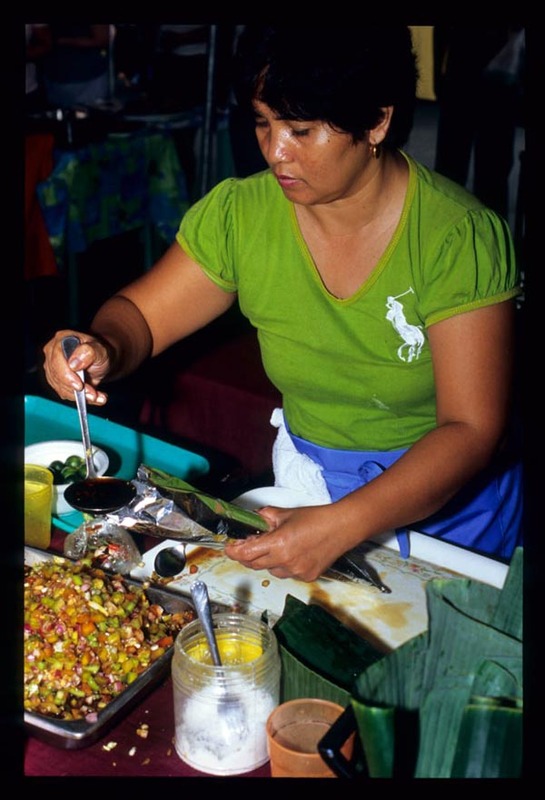 They'd come from Kelantan (the eastern Malaysian state bordering Thailand), where they live, for the month just to sell her nine different kerabu ('salads') made with ingredients like young jackfruit, fern tips, beef, chicken, and wing beans. 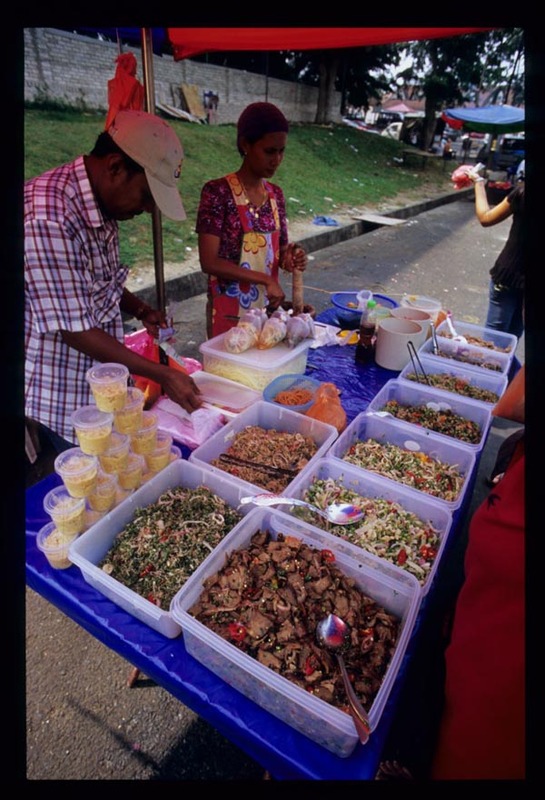 We purchased a selection and ordered a couple of freshly-pounded green papaya salads to go. Another couple from Kelantan assembled beautiful boxes of nasi kerabu (a Kelantanese dish of rice tinted blue with dried pea flours, served with shredded herbs, beansprouts, and kerisik, dry-toasted grated coconut) and added turmeric-marinated and deep-fried fish and a whole green chile stuffed with coconut-enriched chopped fish. 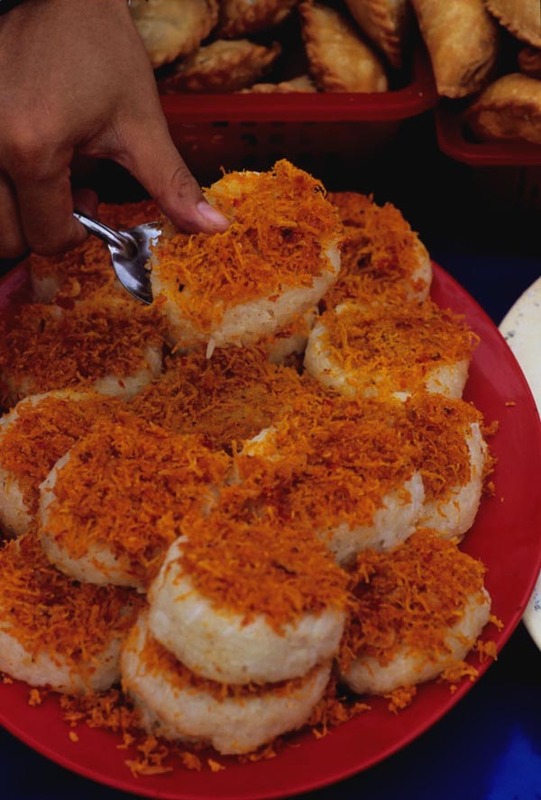 We had to pass it up because we'd already purchased rice, in the form of pulut ubai, coconut-scented glutinous rice cakes with a sweet-spicy topping of grated coconut fried with chilies and turmeric. A jaunt to Temerloh's Sunday market always turns up foods unfamiliar, and so it was for the Ramadan market. We can only guess that these kuih net bug - sponges soaked in tinted sugar syrup - are named for their incredible, insect-attracting sweetness. The highlight of the evening came when we discovered, at one end of the market, the mother of all perfect palm sugar vehicles. 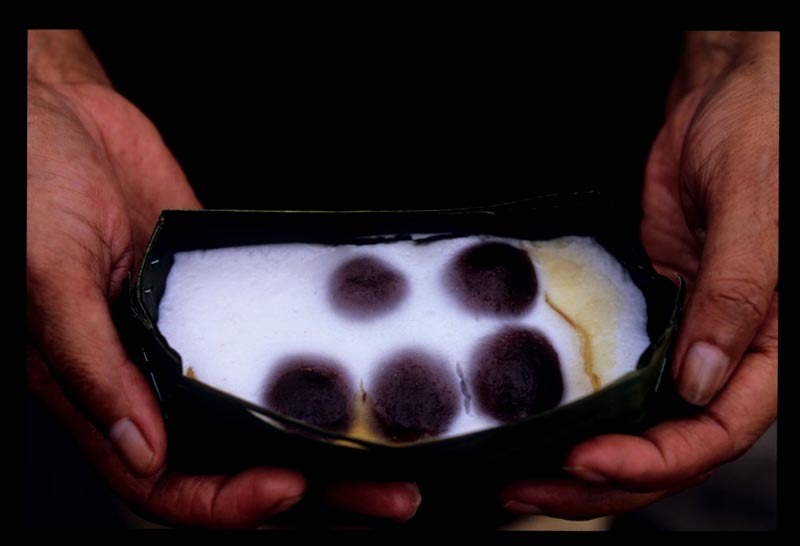 Called badap berendap, bedak berendam ('wading hippos') these sweets consist of gula Melaka (Malaysian coconut palm sugar)-flavored glutinous rice balls enclosing yet more gula Melaka, floating in a banana leaf filled with unctuous coconut cream. For serious gula Melaka fans (count us among them), it doesn't get much more sublime than that. We left the market with a full bag (we ate very well that night), and a certain sense of sadness that Ramadan would soon be coming to an end (we'd have no opportunity in its waning days to take advantage of the markets). Happily, there's always next year.